Pressured by his European agent to write shorter, more "airplay-friendly" pieces, Piazzolla produced Libertango in 1974. This was during the period from 1971 to 1978 when he was working with a highly electric and eclectic nonet, Conjunto 9, which gave his work a more commercial, rock- and jazz-influenced sound. But when Piazzolla re-formed his mainly acoustic quintet in 1978, Libertango was one of the pieces that easily survived the transition back to Piazzolla's earlier, grittier, more intimate sound. Although details varied from one performance and recording to another, Libertango, a "sort of song to liberty," begins with an extremely fast, busy piano solo with bass (acoustic and electric) support. Piazzolla's own bandoneón soon takes center stage for the remainder of the piece, which moves forward relentlessly. After a very brief respite three-quarters of the way through, the material returns even faster and more urgently. 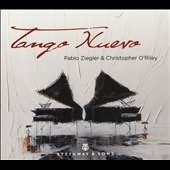 Too frantic to be either a successful song (although French vocalist Guy Marchand did record a best-selling version in 1975) or a practical dance (except for the most elite specialists), Libertango is one of Piazzolla's pure concert tangos: compact, dynamic, and unforgiving.